Known as Middle Earth to many, New Zealand’s diverse landscape was a natural choice for the filming of the Lord of the Rings trilogy. And it’s that same natural diversity that draws visitors to this unique thermal wonderland. From mud pots and geysers on the North Island, to healing hot springs and glaciers on the South Island, there’s no shortage of natural beauty in this island nation. And although the whole country is striking, these two South Island hot springs are a must-see, as not only are they both wonderfully relaxing, but they’re also wheelchair-accessible. And the scenery along the way is just an added bonus. Located just 90 minutes from Christchurch, Hanmer Springs has long been a natural retreat, thanks to the healing waters of the thermal springs. 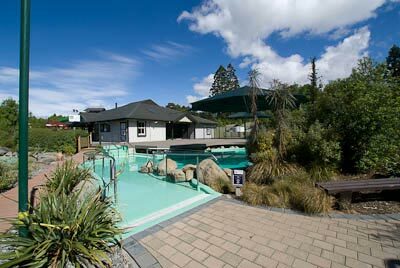 In fact Hanmer Springs Thermal Pools (+64 3 315 000, www.hanmersprings.co.nz) has been welcoming visitors for over 125 years. The natural waters coupled with the clear alpine air are the perfect combination for a relaxing getaway. 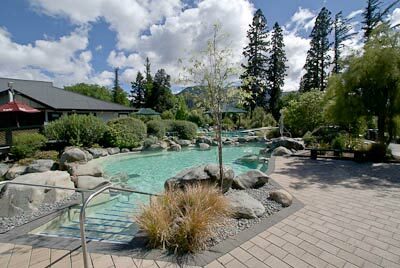 Hanmer Springs Thermal Pools offers 15 open-air thermal pools of varying temperatures. There’s level access to the main office, where you pay your admission; and good pathway access throughout the whole complex. Wide level paths lead to all the pools and there is ramp access up to the Garden House Café. The Rock Pool complex, which features four interconnected pools, has a zero entry pool and a pool lift. It’s located right in front of the Garden House Café, and it’s a great place to soak away the stresses of the day. And if you’d fancy some lunch, the Garden House Café serves up light lunches, snacks, wine and a la carte entrees. There’s also level access to the locker rooms, which feature private accessible changing rooms that come equipped with a toilet with grab bars and a roll-under sink. They’re very large — large enough to comfortably turn around in a power wheelchair. All in all, Hanmer Springs Thermal Pools is a very relaxing and accessible diversion, so plan to spend the whole day there. 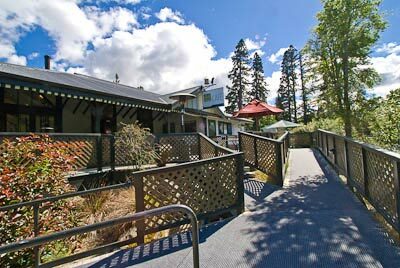 If you’d like to overnight in Hanmer Springs, than make sure and check out the accessible accommodations at the Pines Holiday Park (+64 3 315 7152, www.pinesholidaypark.co.nz). It’s located just a short walk from the thermal pools; and although it’s primarily a campground and RV park, they also have a nice accessible cabin. Cabin 3 features accessible parking in front, with ramp access up to the cabin. There’s a wide sliding door with a level threshold at the entrance, and plenty of room to wheel around inside. It’s furnished with a bunk bed and a double bed, and located close to the shower room and the community cooking facilities. 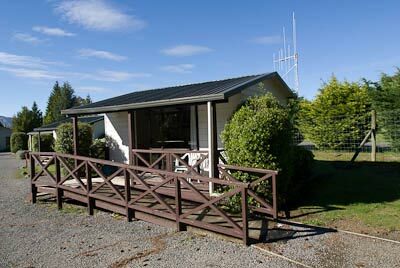 It also has a small porch – a great place to enjoy the spectacular mountain views. 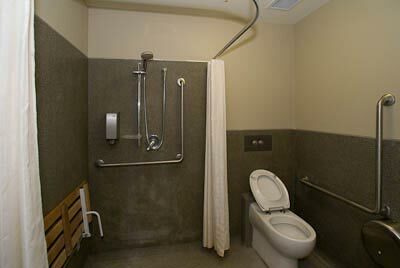 The shower room features level access and includes an accessible toilet stall with grab bars, and a roll-in shower with a hand-held showerhead and grab bars. There’s also a plastic chair in the stall, which can be used as a shower chair. There’s level access to the shared cooking facilities which include a sink, a stove and oven, a microwave and a refrigerator. Alternatively you can hire a grill for the evening, which also comes with a sheltered picnic area and a wheelchair-accessible picnic table. It’s a no-frills lodging option, but it’s kind of a fun place to spend the night after enjoying a day of soaking in the hot springs. For a very scenic drive from Hanmer, head over to Hokitika on the west coast. Along the way you’ll traverse the Southern Alps through Porter’s Pass and Arthur’s Pass National Park, and catch some impressive views of the Waimakariri and Otira River gorges. 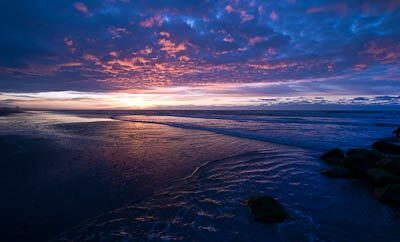 Located on the coast, Hokitika is a good place to overnight, as it’s located about halfway between the two hot springs. The Shining Star (+64 3 755 8921, www.accommodationwestcoast.co.nz) is another holiday park with campground, motel and cabin accommodations, but they also have some very nice wheelchair-accessible beach chalets. There’s ramp access to the chalets, which are located directly on the beach. Both units have two beds and a mini-kitchen with lowered appliances and barrier-free pathway access. Unit 1 has a bathroom with a roll-in shower with a hand-held showerhead and grab bars, grab bars by the toilet and a roll-under sink. Unit 2 is a good choice for slow walkers, but wheelchair-users will have a hard time navigating around the shower partition. Both units have spacious beachfront decks, where you can enjoy the impressive west coast sunsets. Last but not least, don’t miss the Glacier Hot Pools (+64 3 752 0099, www.glacierhotpools.com), located just down the coast in Franz Josef. According to the local legend, these pools are fed by the waters of Ka Roimata o Hinehukatere, the frozen tears of Hinehukatere for her lost love. As the story goes, those tears of love were frozen by the gods, forming what is now known as the Franz Josef Glacier. There’s level access to the Glacier Pools entrance, with good pathway access around the three main pools and the three secluded private pools. 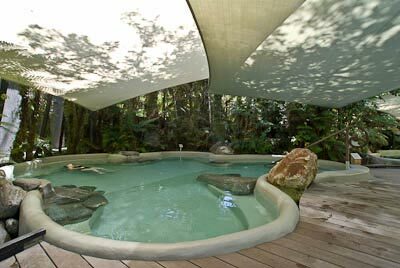 The pools are surrounded by ferns and a heavily wooded rainforest, and protected from the elements by a light cover. There is lift access to the hottest pool and one of the private pools. Although children are certainly welcome, Glacier Pools has more of an adult atmosphere, as compared to Hanmer Springs Thermal Pools. It’s just not the place for kids to run around and splash. Glacier Pools also features level access to the changing rooms, which are equipped with a roll-in shower with a fold-down shower bench, grab bars and a hand-held showerhead. So stay a few days, explore the area and take advantage of this wonderfully accessible hot springs. You’re not likely to find anything like it in the world, so definitely don’t pass this one by.